Following a remarkable 2017, when GDP growth attained 4.5%, Latvia’s economy will keep prospering at its potential in both 2018 and 2019. 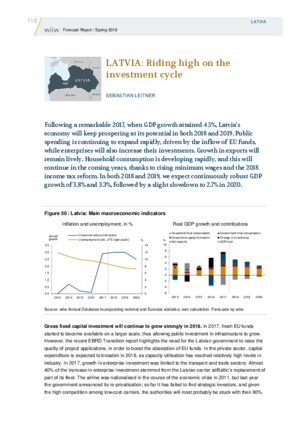 Public spending is continuing to expand rapidly, driven by the inflow of EU funds, while enterprises will also increase their investments. Growth in exports will remain lively. Household consumption is developing rapidly, and this will continue in the coming years, thanks to rising minimum wages and the 2018 income tax reform. In both 2018 and 2019, we expect continuously robust GDP growth of 3.8% and 3.3%, followed by a slight slowdown to 2.7% in 2020.